This is just a simple post on an organizational method while painting that can make things a little easier on you. When I'm painting a model, I like to gather the paints together that I'll be working with. There are a number of reasons I like to do this, and I wanted to cover them in this post. Here are the colours I recently used while painting my Pumpkin Golem. The bottom row are the base colours I used for each of the parts on the miniature. These are the first colours I paint and usually wait until they're on the miniature before choosing the rest. I always have an idea in mind of what the middle-ish row(s) will look like, because these tend to be the colours you're working towards. Once I've got the base colours down, I look out at my sea of colours and choose all the shades I'll need whether they'll be going straight on, or getting mixed together. 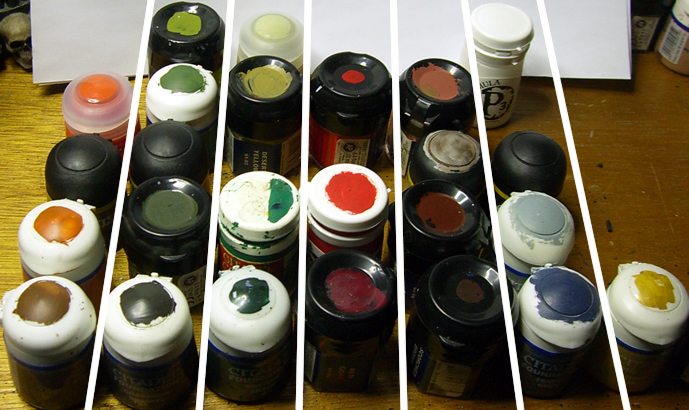 I pick out all the paints I'll need and line them up in columns behind my first colours. I leave blank spaces if I'll be skipping a step. As I'm painting, I may change colours if I decide something needs to go in a different direction. It's very easy to see where your colours are going and get an overall image of your model. You can see how all the colours on your model are going to play together. You're not hunting colours mid-project. When blending, you've already got all the transitions chosen. If you have to go back a step, miss something or touch something up, you've got everything you need right in front of you. When you create your painting journal (more on this in its own post) all the colours are laid out and you can write them down later, rather than interrupting your process after each colour. The Pumpkin Golem was primed black, which is why I'm starting with dark colours and working to lighter ones. Depending on your method of painting, you might shuffle your rows around. For example, when I'm painting with lighter colours, my first two rows in the above photo will usually be flipped and I might have some darks near the top. That's a pretty interesting way of doing it. I'm awful haphazard- I keep the paints I am using nearby, and pull as needed when I get to the next step. Most times I'm not sure what I'm doing from step to step (especially on my OWN guys where I can afford to change my mind) so this is a definite change for me to consider. Yeah, I used to work where I pull out the paints I use on the model as I need them and they all kinda gather around me... At some point I started planning more where the colours are going and used this method to organize myself.